You’ll be guided through the steps and can stop at any point to come back later, picking up where you left off. Before you get started, it’s a good idea to have some key pieces of information ready to record in each section of the Setup chart. TIP: If you are unsure where to get this information, have a chat with your accountant or bookkeeper. Once you have recorded your bank account information, you can sign up for our free bank feeds service, which allows transactions to automatically arrive into your Cash Manager Focus farm business. You can add users or change existing user permissions to your farm business at any time. If you are a Farmlands shareholder, you can also sign up for our free monthly Farmlands feed. 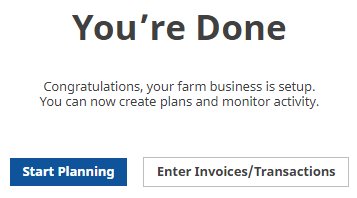 Monthly invoices automatically appear in your farm business, all you have to do is code them. start entering invoices and bank transactions.